Our page count of The Straits Times showed a fall of 12.5% y-o-y (2QFY17: 12.7%). The pace of decline appears to be moderating, and print revenue decline for FY18 appears to be shaping up for 10-11% for the year. We note a slight decoupling in the correlation between physical page counts and print revenue. Our earnings estimates are unchanged. Maintain HOLD with a revised target price of S$2.46. Entry price: S$2.40. Based on our page count of Singapore Press Holdings’ (SPH) The Straits Times, total page count was down 12.5% y-o-y in 3QFY18. By segment, the Recruit, Classifieds and Display ads saw declines of 10%, 15% and 12% respectively. Except for Display ads, the 3QFY18 decline represented an improvement from that seen in both the same period last year (3QFY17) and the prior period (2QFY18). Page count decline comparable to the 12.7% y-o-y decline seen in 2QFY18, while at the same time representing an improvement from the 13.7% y-o-y decline seen in 3QFY17. The figure reflects a q-o-q improvement, which is largely expected given that the third quarter is traditionally strong. Correlation between physical page counts and ad revenue falling. A strong correlation between our page count and revenue had existed. However, this has weakened since 1QFY18, as noted by the smaller-than-expected revenue decline vs the page count decline. This suggests that there may be underlying reasons such as higher ad density or more full-page ads that our simple page count does not capture. Another reason is the integrated marketing approach SPH has taken for its advertising, which presumably is driving higher take-ups. Print revenue decline shaping up to be a 10-11% decline for FY18. Assuming that 3QFY18 sees a revenue decline of 9-10% y-o-y like in 2QFY18 – which had a similar page count decline – full-year print revenue would shape up for a 10-11% decline. Our assumption currently stands at a 13% y-o-y decline and we will look to 3QFY18 actuals before revising our assumptions. A revision upwards to a 10-11% decline translates to FY18 earnings of S$216m-219m (+3-5% to our current estimates). No change to earnings or dividend estimates. Our dividend forecasts are unchanged at 13 S cents per year for 2018-20. Maintain HOLD with higher target price of S$2.46. Our target price rises slightly, largely due to the incorporation of the actual holding value of M1 as of FY17, which lifts the valuation of SPH’s investments from S$0.38 to S$0.45 per share. 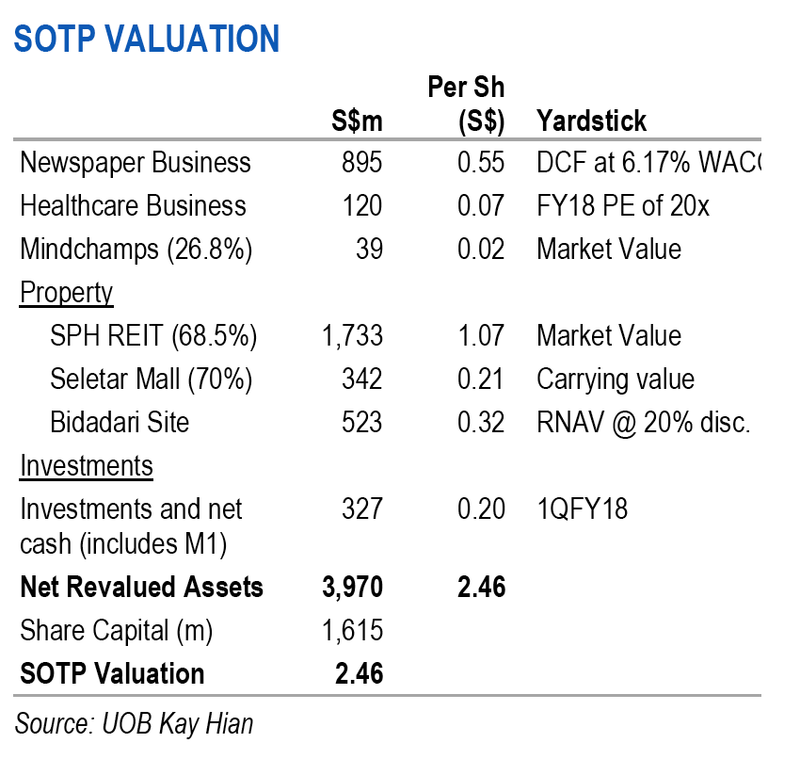 SPH's share price is currently up on positive sentiment arising from the move towards overseas property asset management and the lower-than-expected print revenue decline in 2QFY18. Future property acquisitions can potentially offset media earnings weakness in the short-term and provide share price support. While this is a step in a more positive direction, we remain skeptical about the potential uplift given the property cycle in the target markets. 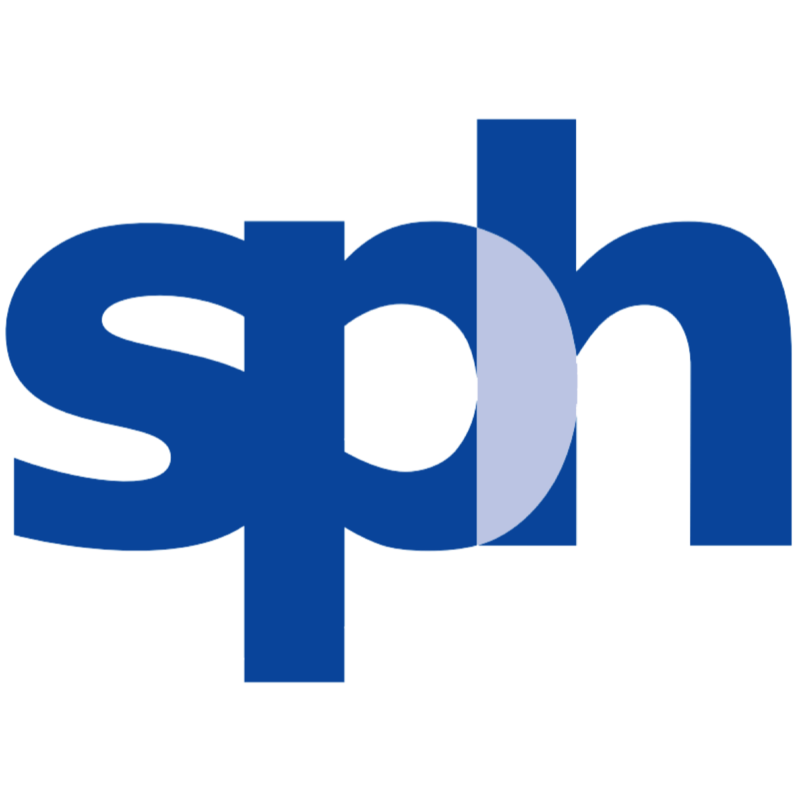 Over the longer-term, SPH needs to fully address the short-comings of the media business in order to justify an earnings recovery and spur a re-rating. Maintain HOLD, entry price S$2.40.